The testing and analysis procedures involved in modern-day medical diagnostics is slowly moving away from what many may see as the archetypal ‘lab-based’ setting, thanks to advanced biotechnology and technology. Medical science is slowly becoming less dependent on using fiddly glass equipment and complicated protocols, and instead turning to state-of-the-art sample collectors, sensors and corresponding electronic machines that analyse the biological data they collect. These advancements are often the results of research and development at the academic or industrial-partnership level. 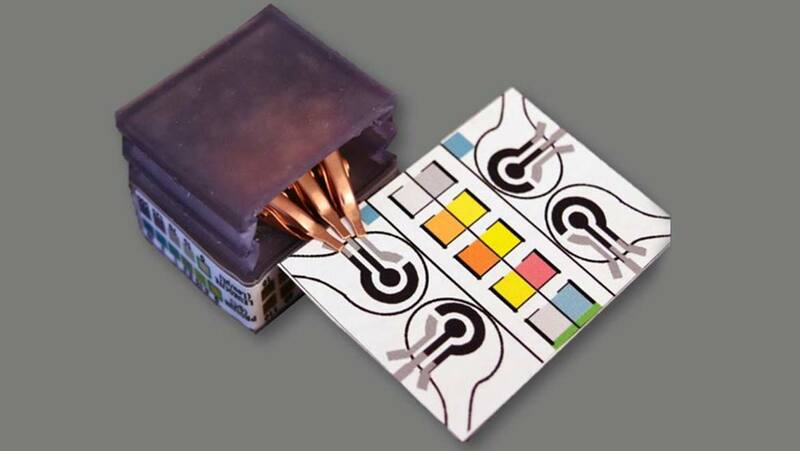 An example of next-generation medical diagnostic equipment is the self-powered, paper-based electrochemical device (SPED) which can deliver medical analysis without any traditional lab paraphernalia. The SPED is the ‘system-on-a-chip’ of medical science. It can collect samples then process them using high-tech reagents before returning relevant data on the health status of the sample donor, all by itself and in any setting. A SPED is also made of conventional materials that are flexible, plentiful, and easily disposable, meaning that it can be easily transported, deployed and disposed of when it has done its job. It resembles a computer processor at a large scale, yet can display information on the samples it collects in a readable form. The SPED was developed by Assistant Professor Ramses Martinez and his team at Purdue University. These thin sensors are made of print-outs of hydrophobic material; in other words, the gaps between these hydrophobic areas form hydrophilic channels that can take up biological samples. This leads them to specially-designed molecules in the paper that change colour when exposed to certain substances in the blood. In other words, the SPED is a colorimetric sensor that could be used to help diagnose various health problems or assess health status. The hydrophobic patterns are printed on to a cellulose paper substrate, so that blood can be taken up by the hydrophilic channels, in a manner defined by microfluidic physics. The channels convey the samples to other zones on the SPED, where it undergoes an electrochemical reaction to elicit the colour changes associated with the health metrics of the patient. The SPED can take up samples from a drop of blood placed on the appropriate circular area of the sensor. Alternatively, a specific region of the SPED that contains ‘nano-pipettes’ can also be dipped into a sample to analyse it. The SPED can also be manufactured using familiar, conventional processes such as roll-on-roll imprinting or spray-powered deposition. The team behind this innovative sensor intend their work to benefit people whose circumstances prevent them from seeking medical attention at a formal healthcare centre. Therefore, agencies or charities involved in bringing healthcare to communities in remote areas, as well as those that are affected by poverty, war, natural disasters or famine, could easily bring a supply of SPEDs with them for use in the field. SPEDS also have the advantage of autonomous power – each paper sensor is also equipped with a triboelectric generator. Triboelectric power results from the conversion of friction energy into electricity, and is an ideal solution for a standalone medical device in the possible absence of reliable power supplies. The team at Purdue installed their triboelectric generator at the bottom of the SPED, which can be rubbed or pressed to generate the power necessary to power sample analysis in the device. The results of the analysis are the colorimetric readings displayed on the upper surface of the SPED. These can be interpreted by an appropriately trained user, or by an application that could be run on a smartphone or computer with a camera that can capture an image of the SPED’s surface, like a sophisticated, medical-grade QR code. Alternatively, a single SPED can also be connected to a small device called the ‘potentiostat’, which can automate the process of sample analysis, thus allowing it to be operated by an untrained individual. At present, the SPED is empowered to detect health-related metrics that include basic white cell count, blood glucose, blood uric acid levels and ketone levels. The analysis of these metrics gives relatively basic information on the health of several key organs, such as the liver, kidneys and pancreas. It may also give an overview of a patient’s nutritional status and risk of metabolic disorders. Future generations of the SPED that include the sensor technology necessary to detect specific conditions, such as dengue, hepatitis or HIV, are also part of Dr. Martinez’ long-term vision. As a paper-based device, the SPED can also be disposed of easily, and can also be incinerated – which is the appropriate destination for clinical waste that contains patient blood in a healthcare context. Dr. Martinez and his team also believe that the SPED will be cheap to manufacture, adding to its advantages as a medical application in the field. The device also eliminates the need for clean or purified water, which are components of medical testing in some cases. This is important because there is no guarantee that clean water would be available in the situations for which the SPED is intended. Other potential applications of SPEDs may include personal monitoring for patients with conditions such as diabetes, telemedicine and medical testing carried out as part of home care. This includes the constant medical monitoring and care administered to patients, often elderly adults, in their own homes. The SPED is a mini-system for the collection and analysis of biological samples that is printed onto paper and mounted onto its own little triboelectric generator. It allows for medical diagnostics than can be used by untrained individuals or even partially automated. The SPED was invented by a team at Purdue to address the problem of limited resources or professional laboratory support in locations affected by adverse conditions or circumstances. It offers information such as the basic health metrics of the liver and kidneys. The Purdue team also intend to develop more advanced SPEDs that can offer more complex analytics and possibly detect dangerous virus-related diseases such as dengue fever. The SPED also represents the evolution of medical science through sophisticated, specific technology. Pal A, Cuellar HE, Kuang R, Caurin HFN, Goswami D, Martinez RV. Self-Powered, Paper-Based Electrochemical Devices for Sensitive Point-of-Care Testing. Advanced Materials Technologies.1700130-n/a.